In blustery and wet conditions, the Wallabies were restricted to two penalties from Stirling Mortlock. Ronan O'Gara landed three penalties for Ireland plus a conversion. Ireland's first-half display was particularly impressive and earned them a standing ovation from the Dublin crowd. Thought Rog was excellent in the first half, Boss was also very good, as were the entire forward unit. The second half was pretty poor compared to the first, but our defence was incredible. Does anybody have any stats, I can't imagine there were many missed tackles. Can't say that anybody played poorly, even though the scrum suffered a little bit towards the end of the match. I thought Australia were a disgrace and should be ashamed of themselves. Every man looked like he wanted to be elsewhere. They looked totally disinterested and their interest only perked up when there was a bit of handbags to be had. Still hats off to the Irish lads - Great first half considering the conditions. But for me I still have no idea where we are in relation to next years RWC. IMO we have beat two very poor teams well. But I would imagine both sides will be different outfits come September next year. The main positives for me from the game were the performanc of the newcomer's to the team in the AI's. Rory Best's throwing was impressive given the wind; Boss showed that he is a viable alternative to Stringer; and Young did well against very average competition. Neil Best deserved the MOTM. We seem to be finding some more depth, which is good news for the WC, although Young needs to be tested more. Negatives - we're gonna get minced against a good scrum. Positives, pretty much everyone played well. Trophy for only the second time in its seven-year history. orchestrate the two tries to win. the home team that adapted to the conditions the best. half and threatened the Australian line almost from the outset. the cover defence to crash over. and was replaced by Mat Rogers. second try and a 15-3 half-time lead. the third man in, also given a 10-minute spell on the sideline. as the Irish forwards continued to dominate in the slippery conditions. the last 30 minutes of play. Ireland's second ever win over the two-time world champions. established core of players is now evident for all to see. is that they were second-best to Ireland in every facet of play. the weather was worse than filthy. Beach rather an a wrestle in an Irish bog. enough to the truth. Where are the All Blacks when you need them? fighting; Denis Leamy joined them for his role in the same skirmish. the visitors that bore an early penalty goal. Irishman to knock-on in the act of scoring. So all you donkeys out there; why the scrum so patchy today? Was it down to concentration or what? Am I being blinkered &amp;/or unfairin considering that to me the weak link seems to be as much Malcom O'Kelly as it is any of the props who took the field today - if not more? Young isn't a good scrummager, I thought he was better than that but after the last 2 games and Llanelli game I now have doubts. On the defence side I'd say the s**te conditions didn't make it easy to scrummage. One big plus - no one can say this time that the weather helped us, if it'd been better we'd have put 40 past them. We now know a couple of things for sure: We have an option at scrum half and the pool of props available remains very shallow. And beating southern hemisphere opposition is always enjoyable. Unfortunately we remain completely in the dark with regard to cover at ten. EOS still refuses to take a risk and see if Paddy Wallace will sink or swim. 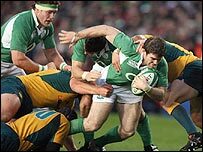 There is no benefit to be derived frombringing onthe likes of O'Kelly and Easterby, we know what they can do but an injury to ROG and it could all fall apart. In the professional era beating Australia should not be considered a massive achievement in a friendly simply because they are Australia. You take from that sort of game what you risk putting in to it. Unfortunately the coach remains obstinately conservative rendering this game almost meaningless. far be it from me to defend EOS but do Australia call it meaningless when they beat other sides in the summer? If we beat France this 6N we will have proved we can live at the top, it's now just a question of this being the start. In terms of 10, I would have liked to see someone play more but we have 1 more game for Wallace and Staunton to get game time in. We have bench appearances in 6N and then the WC warm up games. There's time still for a 10 to come through to be back up. No doubt about it Red, when big Mal entered, the scrum disintegrated completely having been merely a shambles up to that. Kooder faced teh abyss for a few minutes there today with O'gara injured. It would have been much more interesting to see how things would ahve gone if ROg had to withdraw. And yes Omer, i thought that even though we lost the Summer games down south, we did a lot of good stuff that was carried on today, so in a word they were meaningless results wise. If Leamy gets tiem to brush up on a few more of the silkier skills he will be awesome come next September. But will next week be enough of a test? The Pacific Islands can hardly be considered a top class rugby team, they were okay against a second string Welsh team and beaten by a Scotland team who'd be given atough time by the Shannon thirds. Imo, half an hour today would have been far more indicative of Wallace's ability than a full game next weekend, and that's provided he starts next weekend. I don't think he will be good enough for that level but there is only one way to find out. All times are GMT. This page was generated at 06:53.